Martin Everett of The RRW Museum in Brecon thinks that he may have discovered a previously missed defender of Rorke's Drift. 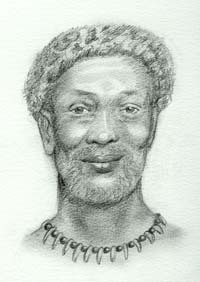 The details of his find are in the discussion forum and can be viewed here. I have traced the exact location of some of the VCs and CS Bourne from Rorke's Drift on Google Earth. If you enter the co-ordinates as listed, they should take you straight to the grave. 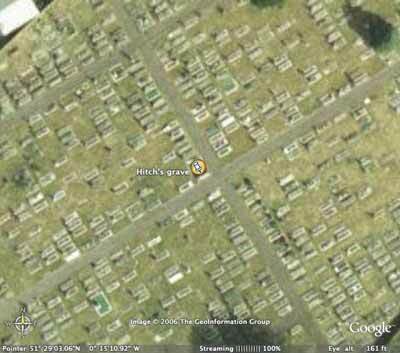 The grave can be seen even closer on Google. All the VCs have either an exact location or as close as possible. The RDVC website has decided to donate 70 of it's specially designed mouse mats for the benefit of the locals of Isandlwana. Pat Stubbs of the wonderful Isandlwana Lodge has generously consented to help with the items. The Lodge will hopefully sell the mousemats in their shop and donate proceeds to worthy local causes. We hope it goes well and thank Pat for her support. We'll let you know how it goes. These are for sale in the shop. Be wary of bogus emails claiming that your membership has been suspended. They are not from The Rorkesdriftvc Support Team. We never send attachments so don't open any, ever!!!. I was told that my membership has been suspended. Cheek! JUST DELETE IT AS SOON AS SPOTTED! I have amended the book reviews section. This now has a fairly lengthy list of books which will open to view if any reviews have been provided. Reviews of these books are invited from anyone who has read them. No qualifications are needed, just an opinion on the various points of the book, presentation, accuracy, style, content, illustrations, value for money etc. If you wish to submit a review of about 250 words (more if you think it needs it), please email [email protected] with the title BOOK REVIEW as the email subject. Please list the book or books with each review. Contributors can be anonymous but will need to be verified as genuine by this site. A name or initials is required for the review to be placed. Please feel free to provide details of other books which are not listed here but you feel should be included. If there are details missing, i.e. ISBN number or incorrect information, please let me know. Some people have indicated that they are having difficulty in working out how to register for the New style Forum. I've just gone through it again and it is very straight forward. If you open up the Forum, in the blue top banner there are categories, one of which is REGISTER. Click on that, agree to the conditions. Fill in at least the basics (marked with * ) in the form, click the 'automatically log in' box and submit. User Name and Password are both case sensitive (ie use the same lower case and caps as you did when filling in the original registration). This will be needed if you use a different computer at any time. An email is then automatically sent to you to confirm acceptance within a few minutes. In that email you have to click the link shown to confirm and then you're a member. When a member, you'll be able to post replies to topics or place new ones, amend, choose styles etc. Very straight forward. Hopeyou enjoy it. It is 100 years since Henry Hook was laid to rest in the quiet Gloucester churchyard of St Andrew's Church at Churcham with much pomp and ceremony. For Private Henry Hook was one of those gallant soldiers who defended the mission station at Rorke's Drift in far off Natal on 22nd/23rd January 1879. Eleven Victoria Crosses were awarded that day - included in this select number was Henry Hook of Churcham whose gallantry under fire was recognized for saving the lives of the sick patients held in the building being used as a temporary field hospital. On Saturday 3rd September 2005 at an impressive graveside service organised by the 1879 Group Living History Group, Henry Hook's passing and gallantry was again remembered. Gathered in the small churchyard were members of his family, comrades from his old regiment - the 24th Foot - now the Royal Regiment of Wales and relatives of other defenders of Rorke's Drift, namely Private Frederick Hitch VC and Private John (Fielding) Williams VC. The service was conducted by the Very Reverend Nicholas Bury, Dean of Gloucester and the music provided by Lydney Town Band. At the end of the service wreaths were laid, and the last post and reveille sounded. The tranquillity of the day was poignantly broken by a volley fired by the 1879 Group as those present paused to remember a truly gallant man of Gloucestershire. One other man remembered during the service was actor James Booth who recreated the role of Henry Hook in the 1964 movie 'Zulu'. This portrayal although memorable, as written by the film scriptwriter, John Prebble, was far from the actual real life character and upset the family considerably. He was to be invited to the service but sadly died age 77 years a few weeks earlier. We are implementing a new style discussion forum. You may well noticed a small change in the look of things. The new forum is designed to deal with our growing user base a little better, and it should also make things easier to find, as well as organise. To see any of the forums listed on the main page, you need to register. You can do this from the menu at the top right of the page. Once you have filled in your details (note: you only need to worry about the fields with a *) you will be sent an email which a link in it. Click on this link to activate your account and you're off and running! You'll now have access to the whole discussion system, and you'll also be able to administer your own member account. One of the main benefits of this new system is that your email address is now secure from the web programmes which mine them for spam purposes. You can also choose whether to show your email address to other users. By default, your address is hidden. Finally, we'd love to hear your feedback! Let us know what you think, and if there's anything you'd like to see, we'll do our best to accomodate it (new forums etc). This will go live tomorrow (31 August 2005) but is available for those who wish to register today at http://www.rorkesdriftvc.com/forum. We hope the transition is smooth. Any problems, please contact us. The 1879 group are planning a celebration to mark the 100 years since the death of Pte Henry Hook VC, the ceremony will be held at Churcham Church, Gloucestershire on September 3rd at 2pm. There is additional information regarding the lineage of William Jones VC. This has been supplied by Tony Jones and can be found by clicking here. David Geeves (James Booth), actor: born Croydon, Surrey 19 December 1927; married 1960 Paula Delaney (two sons, two daughters); died Hadleigh, Essex 11 August 2005. James Booth was a major figure in the British film and theatre world in the 1960s, specialising in playing cheerful cockneys with a touch of larceny. The trade magazine Variety once described him as "a punchy blend of toughness, potential evil and irresistible charm." Visitors to this site will always have a warm spot for the man who played Hook in Zulu. View this Illustrated London News article. Simon Smith, a British artist, is producing a series of excellent paintings of the Anglo-Zulu War. The first of these to become available as prints in different formats is of Rorke's Drift. This can be viewed with details in the 'MARKETPLACE' on this site. A memorial to the Zulu dead at Rorke's drift has been erected. What appears to be a rough wooden fence in the background is part of the symbolism. It is actually a simulation of a traditional Zulu cattle compound. The head of a Zulu homestead (the Mnumzane), would be buried under his cattle compound ('kraal' (corral) in Afrikaans) should it prove possible to return his body to his family home. The cattle are secured there at night, their urine would speed up the decomposition of the body, usually enabling the grave to be re-used by the next in line. Grain pits or disused ant bear holes were also sometimes used. The leopard is a symbol of the Amakhosi, and a Zulu Royal symbol. The shields evoke how the dead were covered (with shields) by their comrades on the battlefield. Originally, war shields were provided by the King, and issued from stores to the regiments based at the various military 'kraals', only on the King's order. Interestingly, it appears to have been installed towards the southern edge of the historical battlefield site (you can see the fence and the school washroom blocks in the background), on what was the axis of the first Zulu attack - and, where heavy casualties were inflicted by concentrated rifle fire from the area of the perimeter between the 'Store' and 'Hospital'. When the spring rains start in September, Amafa intend to plant a Buffalo thorn tree. (Ziziphus Mucronata) or in Zulu, an Umhlalankosi tree. The branches from the tree are frequently used in Zulu burial services and considered a medium for spirits to move between this world and the next. 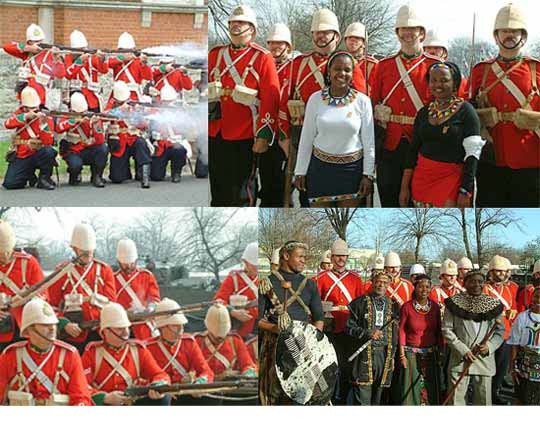 At Rorke's Drift the Umlahlankosi will, in Zulu culture, enable the spirits of the fallen to return home and rest in peace. It will be officially dedicated by the Kwa Zulu Premier later this year. Terri Julians is planning to upstakes and move to KwaZulu Natal in order to help aids affected children. This will cost a great deal and Terri is hoping to raise the necessary finances to make this possible. She is hoping that selling some of her fine drawings will help. After having a stall at Chatham, she was out of pocket after paying for her stall there and the lack of sales. RDVC think that this is a worthy cause and so we have freely placed details of her work in the 'MARKETPLACE' section of this site. If you think you can help Terri, please do. Terri has managed to obtain a stall at the forthcoming Brecon Event (unlike RDVC who failed), so there's a chance to view the work if you are attending. Saturday the 23rd. 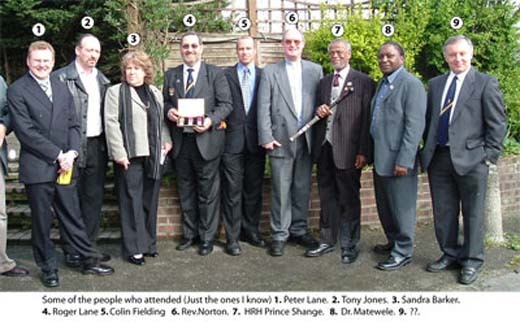 April there was a service dedicate a new stone on the grave of Rorke's Drift defender Sgt. Henry E. Gallagher MSM. The service was conducted by Revd. Paul Norton with talks given by Roger Lane (great grandson), Councillor Cyril Hilton, Ian Knight and Adrian Greaves. There was also a reading from psalm 46. The ceremony was attended by HRH Prince Shange (a descendant of Prince Dabulamanzi), Dr. Paul Matewele (a descendant of King Cetshwayo) and HRH Princess Zinka. Also present were other defenders' descendants. Sandra Barker (Hitch), Colin Fielding (John Williams) both of whom laid wreaths, Tony Jones (William Jones) and Peter Lane (Sgt. Gallagher). There was a display of Zulu War material in the church. The graveside dedication was attended by the Diehards who performed in their usual excellent style, accompanied by bugler Tony Crisp. Refreshments at the pub afterwards were a good opportunity to meet up with others who are frequent visitors to this site, including Lee Stevenson. There is to be a dedication of a new memorial stone to 81 Sgt. Henry E. Gallagher MSM, B Co. 2nd/24th on 23 April 2005. The ceremony will take place at 2pm at Christ Church, London road, Portsdown, Hants. Again, the Zulu event at Chatham promises to be even better! 2nd. - 3rd. APRIL 2005.
â€¢ Open from 10am - 5pm.